Created by Tim Fox on Jul 18, 2006 6:42 AM. Last modified by Justin Bertram on Dec 11, 2010 12:42 AM. Here are some more results. A full set including persistence and transactions should follow shortly. This is really just to give a basic idea of performance and is not meant to be conclusive or rigorous in any way. Results over a network to follow too. As you can see we are way ahead of JBossMQ in all stats. Plesae don't read too much into the absolute measurements since they were done on my laptop. The relative measurements between MQ and messaging are more important. All results are using auto acknowledge and non persistent messages with no body. 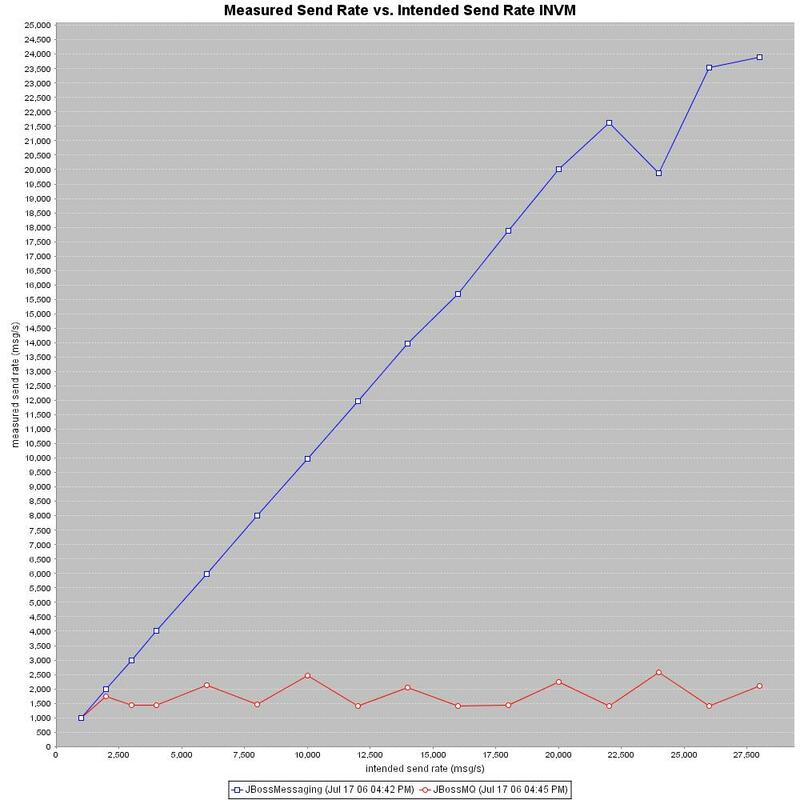 The first graph shows receive rate vs send rate for one consumer and one producer and one queue all in the same VM. The second graph shows receive rate vs send rate for one consumer and one producer and one queue with consumer, producer, and server in different VMS on the same machine and using TCP loopback. The third graph shows send rate for one producer and server all in same VM. The fourth graph shows send rate for one producer and server in different VMs on the same machine using loopback.